Justin Trudeau makes any wedding more interesting. It's a wedding. I barely find a wedding interesting if it's the wedding of someone I know. I don't know anything about the couple except the groom is a son of Princess Di. I think the bride was famous before hooking up with the groom but I'm not sure. The groom isn't hot. Most men look good in formal wear but there's only so much a fancy costume can do. 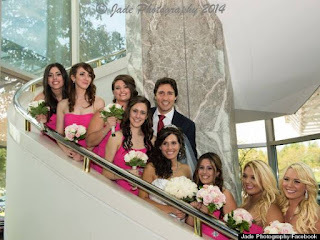 I would watch the wedding of Justin Trudeau though. It a royal wedding. There shouldn't be any royals in the 21st century. Royalty doesn't do anything except leech off the populace. And the ceremonial leeching is dialed up to eleven with a royal wedding. It's a British royal wedding. As I recall, British royalty were the bad guys in the Revolutionary War. Why are Americans celebrating anything related to British royalty? I mean, I am an admitted Anglophile, but not because of hereditary monarchy. I can't believe how many people, British and non-British, care about the royal wedding. It really gets on my nerves.